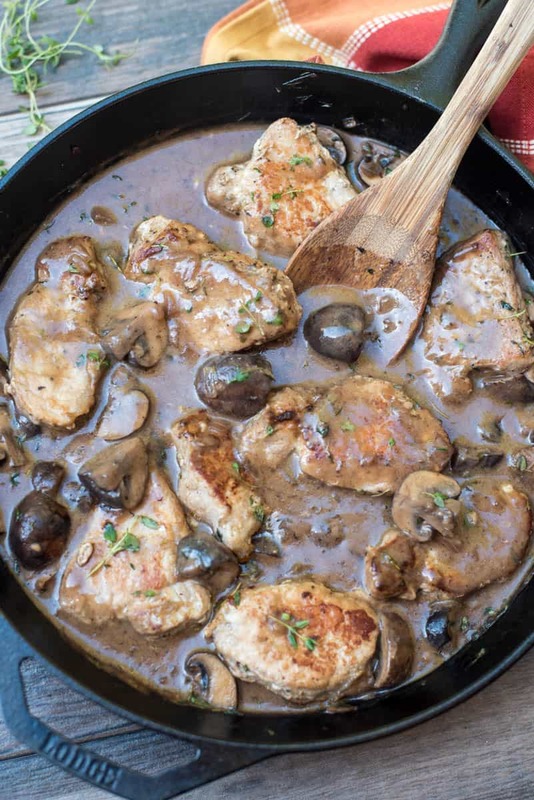 These Steakhouse Mushroom Pork Loin Medallions take less than 30 minutes to prepare, making this recipe a great choice for any night of the week! I’m excited to share this recipe today, friends. It’s a good one. 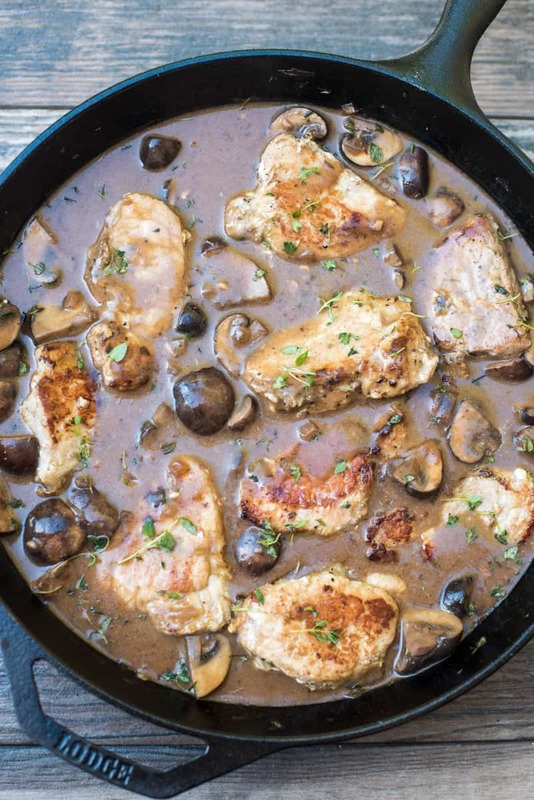 Seared pork loin medallions smothered in a sauce that consists of flavorful, steakhouse style mushrooms with a touch of red wine and plenty of garlic. Finished off with fresh thyme and just enough cream to add a little body to the sauce and make your taste buds sing. Pork loin is a fabulous cut. 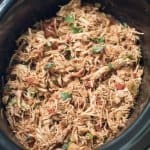 It is extremely versatile and can be prepared in an endless variety of ways to create uniquely flavored dishes. It’s also lean as heck but incredibly tender. And, one of the most important aspects to this busy, working mama – it cooks quickly. Especially when you slice the loin into medallions that can be quickly seared in a skillet, like I’ve done here. 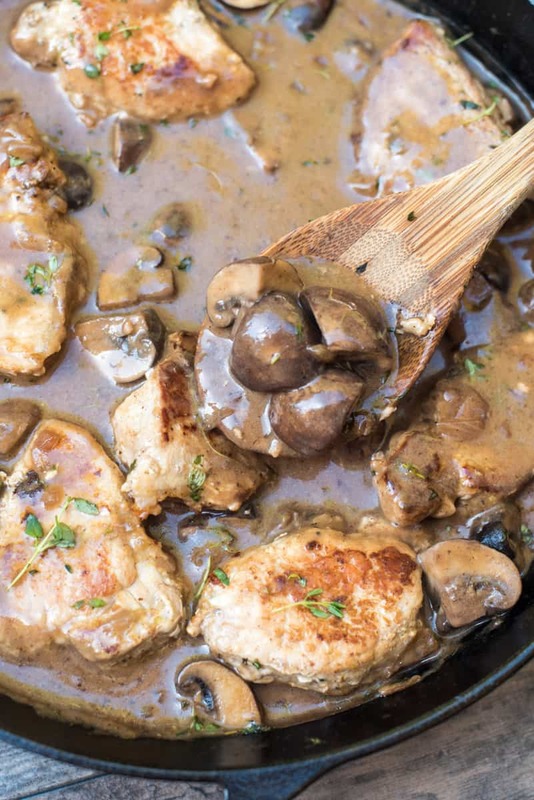 This skillet of deliciousness will take you less than 30 minutes from start to finish. 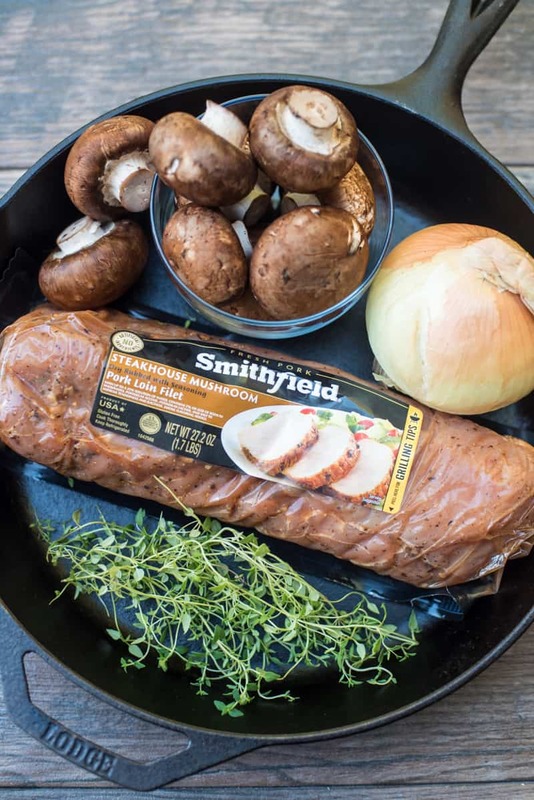 It begins with a Smithfield® Marinated Steakhouse Mushroom Pork Loin Filet. 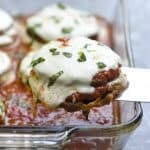 I’d been eyeing these babies at my local Safeway for quite some time so when I was approached to develop a recipe for Smithfield, I was really excited to give them a try. Safeway has a great selection of Smithfield Marinated Fresh Pork products available in a variety of flavors and cuts, including tenderloins, loin filets, and roasts. When I saw this Steakhouse Mushroom flavor, I immediately knew it was coming home with me. I had delicious plans for it! 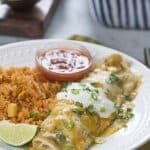 It comes marinated and ready to cook which makes it incredibly fast and easy to get a super flavorful meal on the table any night of the week. 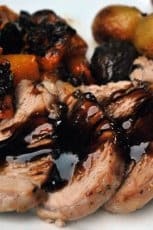 This versatile cut of pork can be roasted, grilled, or sautéed, like I’ve done here. Real flavor, real fast! Start by slicing the loin into 2″ medallions. Sauté the medallions in olive oil in a heavy skillet (cast iron is best!) for two to three minutes per side, until nicely browned and cooked through. Transfer the cooked pork to a plate and set aside. 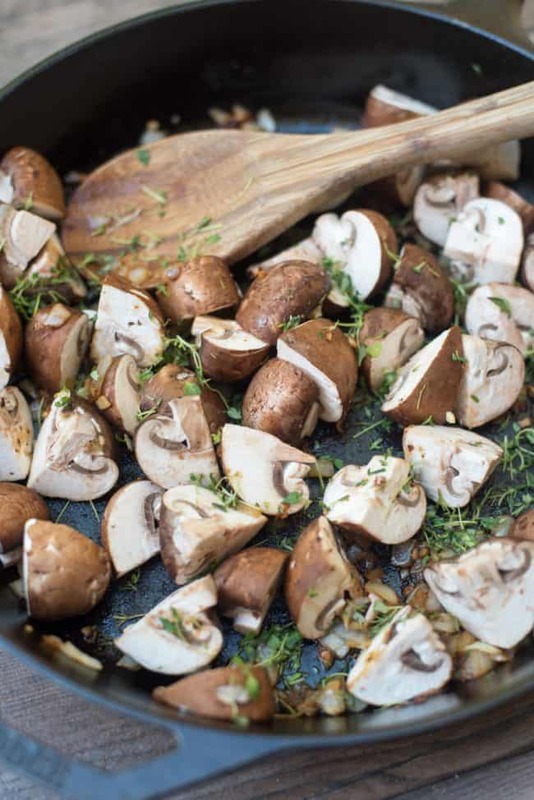 Add a tablespoon of butter to the same skillet and add diced onion, a good amount of minced garlic, cremini mushrooms, and fresh thyme. I wanted the mushrooms to be evident in this dish so instead of slicing, I quartered them. 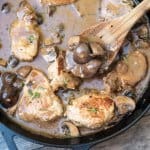 Add a little red wine to the skillet and allow it to sizzle and cook with the mushrooms for a minute or two, infusing them with a fabulous depth of flavor. Add a couple of cups of low-sodium beef broth, a bit of Dijon mustard, and Worcestershire sauce. The sauce is then thickened with a small about of cream or half and half combined with some cornstarch. 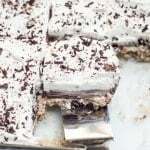 See the printable recipe below for all the details. Nestle the cooked pork loin medallions into the luscious sauce and garnish with some additional fresh thyme. 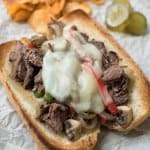 I served it with roasted creamer potatoes and simply cooked broccoli and there was a pretty good chorus of mmm, yummy noises coming from my family at dinner that night. 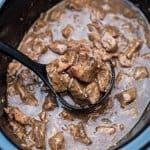 Delicious served with potatoes, rice, or noodles. Add a simple veggie side and you’ve got yourself one incredible weeknight meal. 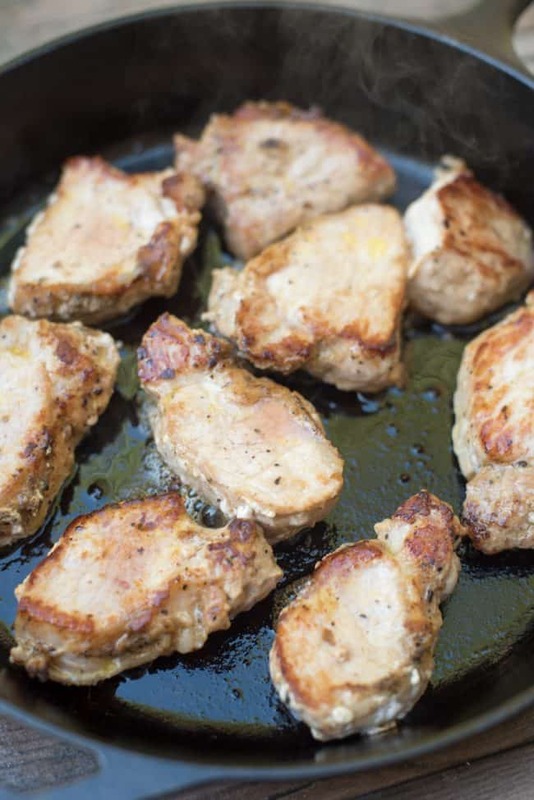 For more delicious Smithfield Marinated Fresh Pork recipes click HERE to visit them online. 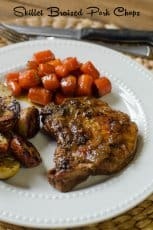 For more pork recipes I love, check out these Roast Pork Chops, Pork Tenderloin with Balsamic Glaze, and these Skillet Braised Pork Chops. Slice pork loin filet into 2" medallions. Add olive oil to a large heavy skillet (preferably cast iron) and place over MEDIUM-HIGH heat. Cook pork medallions for about 3 minutes per side, until nicely browned and cooked through. Remove to a plate and set aside. Reduce heat under skillet to MEDIUM and add butter. When butter has melted add onion and garlic and cook, stirring. When onions have slightly softened, add mushrooms and fresh thyme. 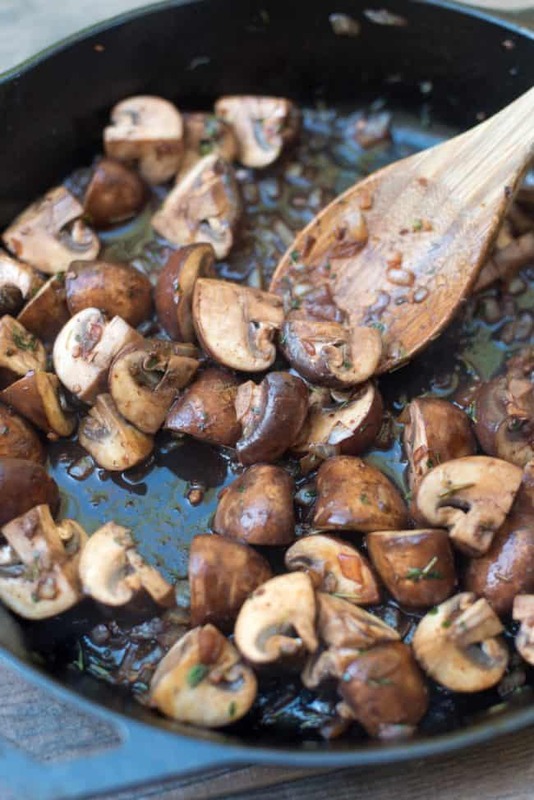 Cook and stir for several minutes until mushrooms are tender. 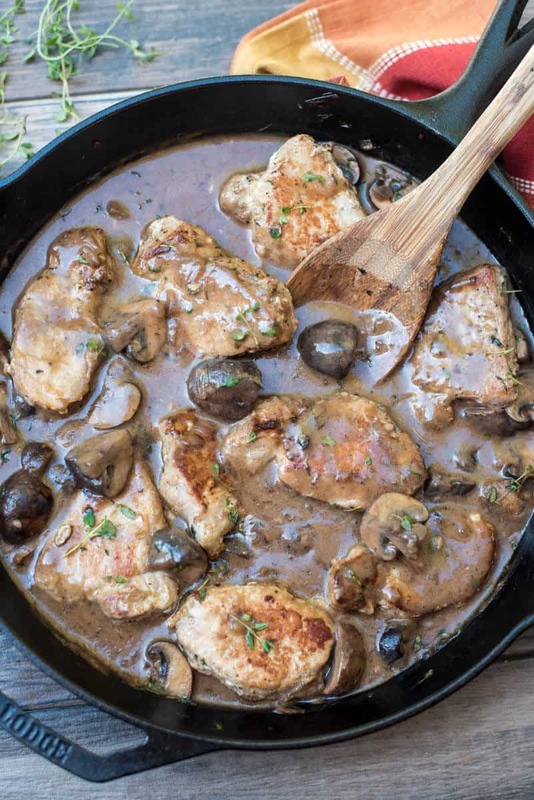 Add red wine to skillet and cook for a minute or two and then add beef broth, Worcestershire sauce, and Dijon mustard. Increase heat under skillet as needed to bring mixture to a low boil and simmer for a minute or two. Reduce heat to LOW. Meanwhile, combine heavy cream (or half and half) with cornstarch in a small bowl, mixing until well combined. Add to skillet and stir until sauce has thickened slightly. Season with salt and pepper, to taste. 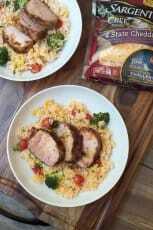 Nestle the cooked pork medallions into the sauce and serve. 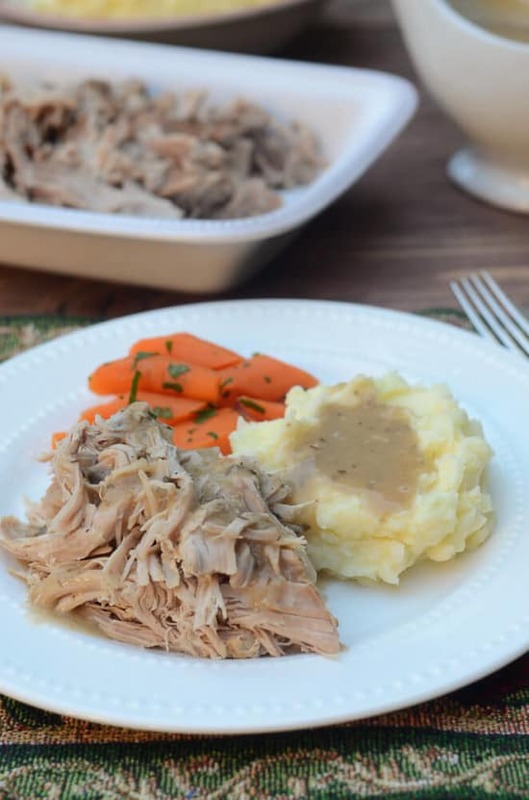 This is a sponsored conversation written by me on behalf of Smithfield® Marinated Fresh Pork. The opinions and text are all mine.